To better reflect the work we do here at the NWHN, the Program Department recently changed its name to the Policy Advocacy Department, but the mission and the team remain the same. Director Sarah Christopherson, Coordinator Christina Cherel, and RWV Regional Field Manager Cecilia Sáenz Becerra have been hard at work on our three principal campaigns. Cecilia has continued working with RWV’s network of 30 regional coordinators to build states’ support for Medicaid Expansion, advocate for policies that support access to comprehensive reproductive health services, and ensure that women know how to enroll and use their coverage. She also plays a critical role in network capacity-building; for example, she recently helped two regional coordinators in Arizona that focus on LGBTQ migrant rights to successfully complete their merger into one organization — now known as Trans Queer Pueblo. This summer, under Cecilia’s direction, RWV released a Spanish-language adaptation and translation of our heath literacy materials, Mi Salud, Mi Voz: Una Guía Paso a Paso Para Mujeres Sobre Cómo Usar el Seguro Médico. Spanish and English versions can be downloaded at www.myhealthmyvoice.com. Meanwhile, we continue to promote our Medicaid expansion toolkit, Cover our Families: A Community Organizing & Advocacy, which provides grassroots organizers the tools they need to build momentum for change in their states. Interested in holding your own house party to spread the word? You can download your copy of the toolkit at www.raisingwomensvoices.net/medicaid-expansion and reach out to Cecilia for tips in how to engage your neighbors. Finally, this summer we helped our regional coordinators prepare for and respond to the biggest women’s health cases before the Supreme Court, including Whole Woman’s Health v. Hellerstedt, the most consequential abortion case in decades, and Zubik v. Burwell, which ultimately punted the question of whether employers can use their religious beliefs to deny women’s contraception coverage back to the lower courts. And speaking of those big court cases, elsewhere in this edition you’ll read about what the Whole Woman’s Health decision means to abortion access going forward. You can count on the NWHN to be at the Court, on social media, and in the halls of Congress, pushing our representatives to build on the Whole Women’s Health victory and to #BeBoldEndHyde to take the next steps toward ensuring reproductive freedom. We called on all of you to reach out to your House representatives to ensure that a vote on abortion coverage restrictions received the strongest possible support from a hostile Congress. We also participated in grassroots and direct lobbying efforts to shine a spotlight on the McCarthy-esque select panel the House majority is using to harass and threaten abortion providers. In partnership with preeminent reproductive justice organization SisterSong, the NWHN drafted a statement of principles to guide providers, funders, advocates, and public health officials in the provision of long-acting reversible contraceptives (LARCs). We strongly support the development of, and access to, the full range of safe and effective contraception, but we’re also deeply concerned that institutional enthusiasm for LARCs threatens individual women’s ability to decide what methods are best for their unique circumstances. Read our statement here: www.nwhn.org/advocacy-issue-long-acting-reversible-contraceptives-larcs. 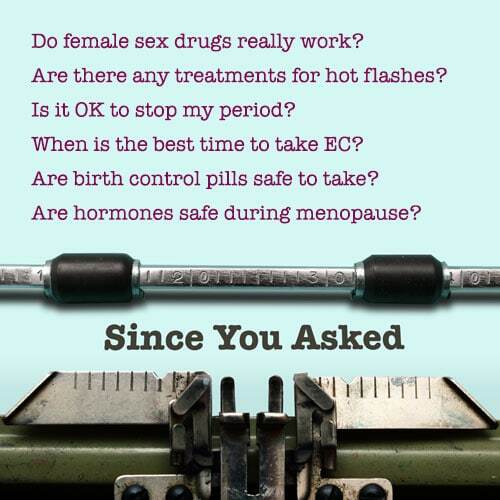 And, we’ve been hard at work pushing the FDA to ensure that menopause hormone therapy treatments compounded by a pharmacist aren’t touted as “bioidentical” or “natural” in order to make them sound like a safer alternative to conventional hormone therapy drugs, since they carry the same increased risks for heart attack, stroke, breast cancer, blood clots, and dementia. In fact, women who purchase compounded hormones to avoid “synthetic” or “pharmaceutical” hormones are often using exactly the same synthetic pharmaceutical hormones, purchased by special pharmacies (called compounding pharmacies) and remixed into pills or topical creams.